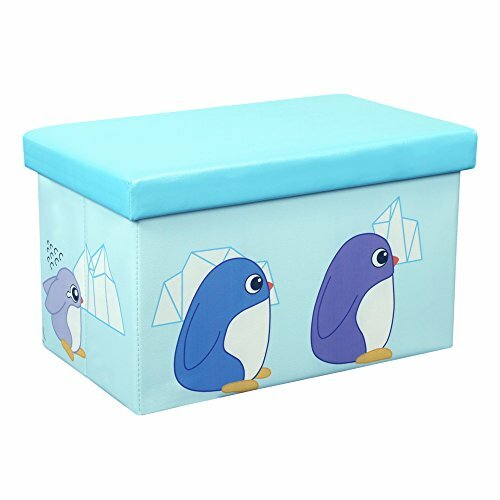 This multi-purpose toy storage check / ottoman is padded with premium memory foam for superior seating comfort and crafted with premium faux-leather for luxurious look and feel. Setup is easy and intuitive and once set, sturdy construction gives stable support while minimalistic design will charm any interior decor without being loud. PERFECT STORAGE FOR SPACE SAVING NEEDS! living room / work space / closet / kids' play room you name its The perfect solution for your organization needs! All those loose items lying around in your living, working and sleeping spaces from blankets, cushions, clothes, remotes, books to little toys now have a place to be neatly stored. ENTRYWAY SEATING SHOE STORAGE BOX Have a crowded entryway? Ever tried balancing on one feet while getting the other foot in? Place this ottoman cube! Its sturdy structure when set up is a perfect seating stool/shoe storage at the entrance or closet. You may sit on it to put on or take off your shoes. FOOT REST Memory foam padded top makes this ottoman a perfect addition to your sofa as a footrest! Thank your tired feet with this memory foam padded ottoman! CARE INSTRUCTIONS Clean cover with a damp cloth or sponge using warm water and mild soap. Wipe dry. MORE DESIGNS AND SIZES AVAILABLE! Otto and Ben offers more designs, colors and sizes of folding storage ottomans! Search for Otto and Ben! Otto & Ben is an accent furniture brand dedicated to making stylish homes more affordable and accessible because at Otto & Ben we believe style must be a choice, not a perk. Expect the best price plus more with Otto & Ben! Great for any room. Super stable & sturdy. Dimension: 23"x15"x15"